When traveling, you want to choose a great place to stay. 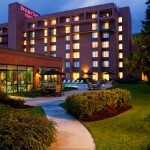 The Best Syracuse Hotel is the stunning Marriott Downtown Syracuse. Not only did we have a delightful stay, but we know that you will as well. 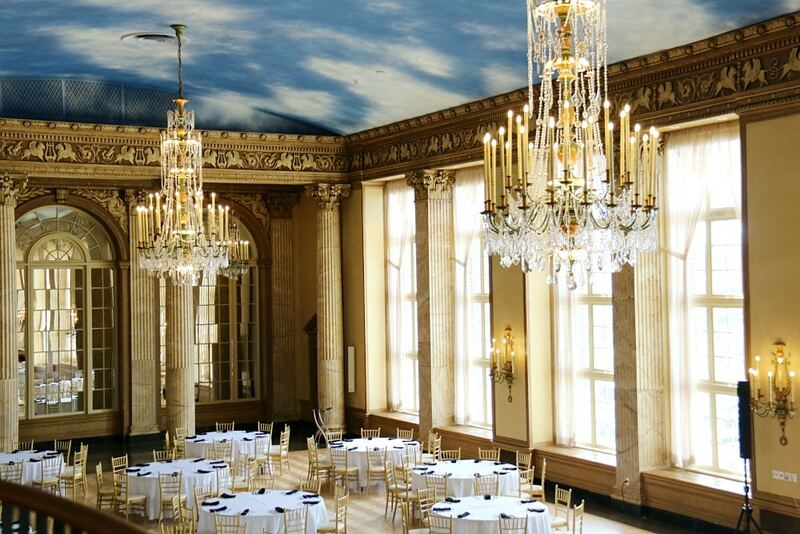 We were captivated by it’s history and the beauty of the Marriott Downtown Syracuse Hotel. Whether you are visiting for business, looking for a family vacation destination or planning a special event it’s truly one-of-a-kind. 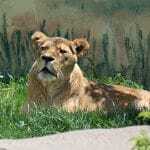 Plus with so many wonderful things to do in Syracuse NY you will want to make sure your stay is more than one night! 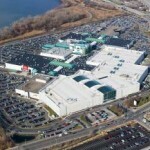 Syracuse, New York is a wonderful travel destination for families and individuals on business. No matter what your purpose for being in the area may be, the Marriott Downtown Syracuse Hotel is a great place to stay. Having recently opened (Late Summer 2016) the hotel underwent a $76 million dollar renovation to restore it to its original beauty while also adding all of the modern touches you would expect from a Marriott hotel. Stunning historic restorations. The original beautiful architecture of this building has been restored, and you will be amazed by the transformation. 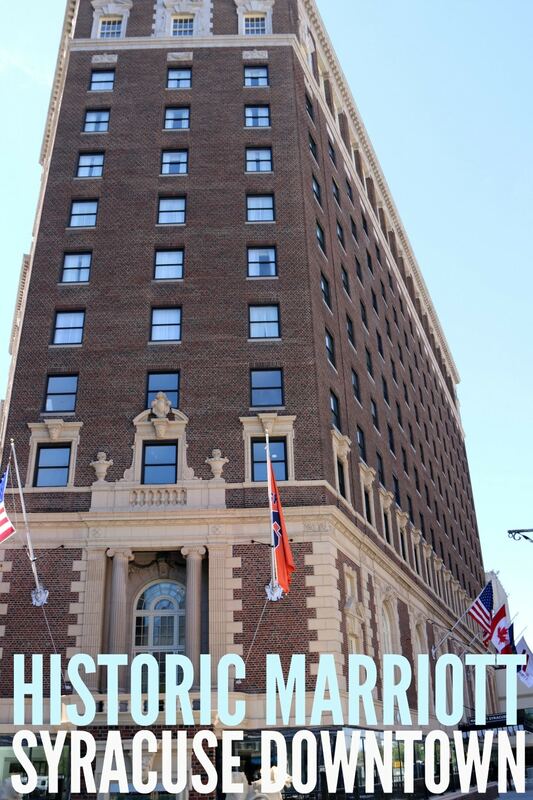 Dating back to 1924, the Marriott Syracuse Hotel Downtown is the place to be for gorgeous views. With both elegant and modern interior and exterior design, you will be astounded at the beautiful way they managed to restore the original structure while pulling off a modern appeal. On-site upscale dining. 24-hour room service is something every travelling family knows comes in handy. Couples staying on a romantic getaway can enjoy the recent addition of an all-new Irish pub on-site for a nightcap or appetizer. Families can relax in the room with the Fresh Bites Menu that is available 24 hours a day. This helps avoid getting out with cranky kids worn down after a day of site seeing. 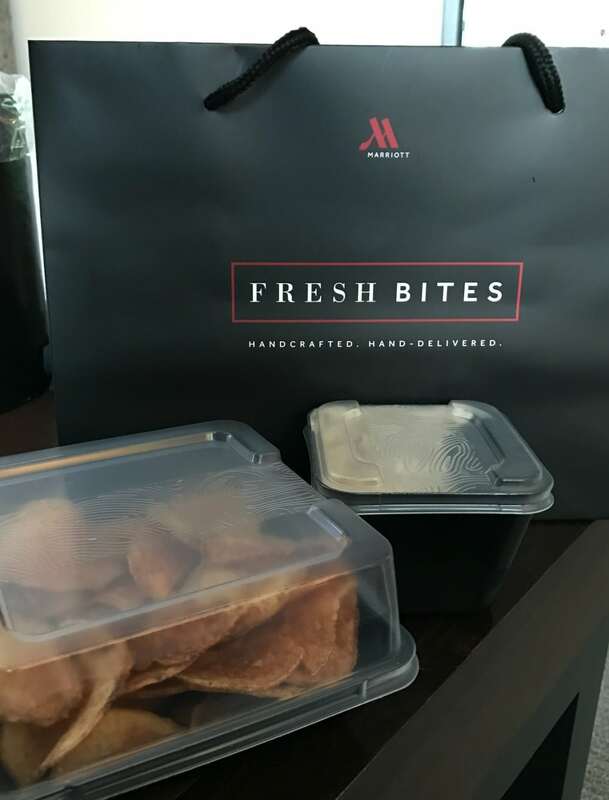 We didn’t have a chance to eat in the other restaurants but did get the world’s most delicious chips & dip from room service. With homemade chips and signature dip the whole family dove in and there wasn’t a crumb left. Hope to try the other options on our next visit. Check out all the options for dining at the Marriott Syracuse Hotel Downtown. We loved the spacious and modern design of the hotel room. Boys had lots of room to play and the adults had room to relax = perfect for a family vacation. We almost didn’t want to leave the room! The bathroom was large and spacious and had the toilet tucked away for some privacy if others are using the sink or shower. 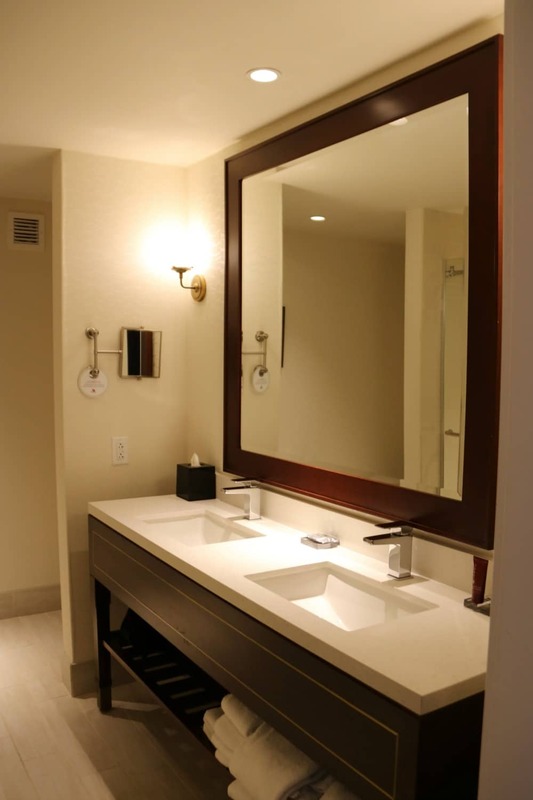 Love having two sinks – sure wish our bathrooms at home at two sinks! 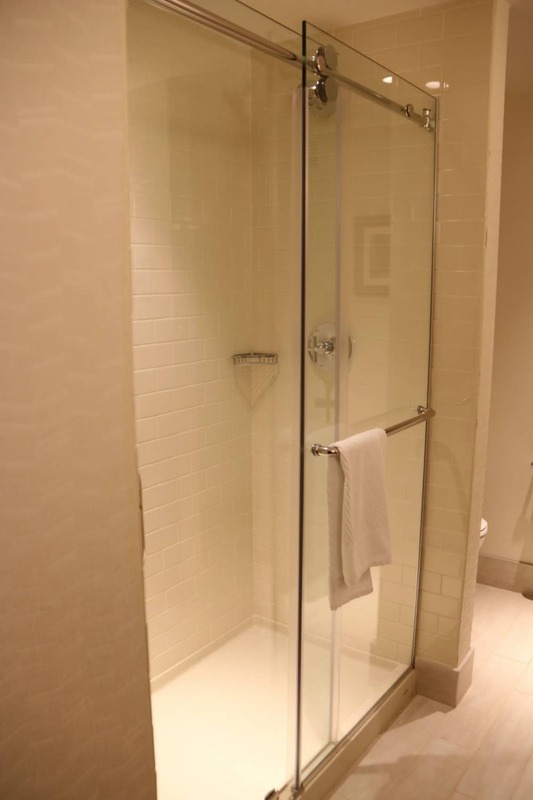 Also, in love with these barn-door style shower doors. Solid, easy to move and guaranteed not to fall off their tracks like the smaller old fashioned shower doors. Historic or Modern room options. 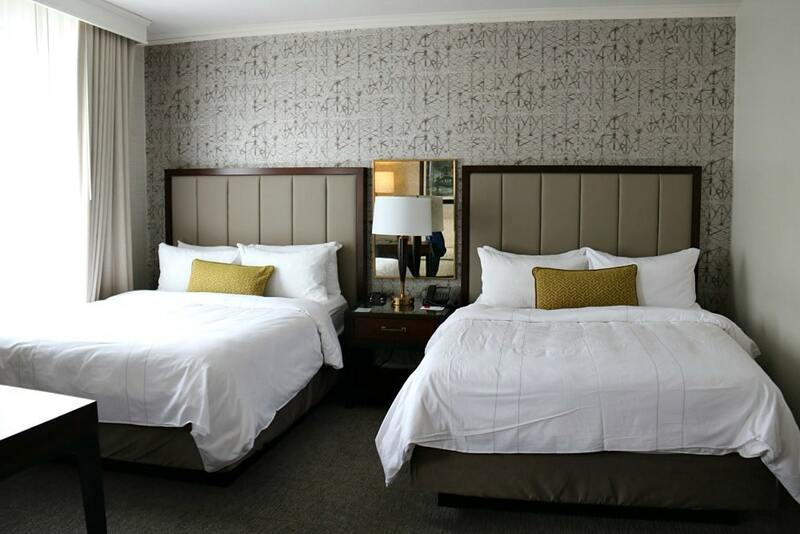 You have the choice of staying in the historic room that appeals to the vintage design while still including modern amenities, or enjoying a fully modernized room with sleek design elements. This fits any personality and offers everyone a room that suits their needs. With queen and king rooms suited for couples, individuals, and families, we have room to fit any travel needs. Check out these awesome features in the door to allow you to call for service and open to vent the room (before air conditioning). And the details kept in the elevators. 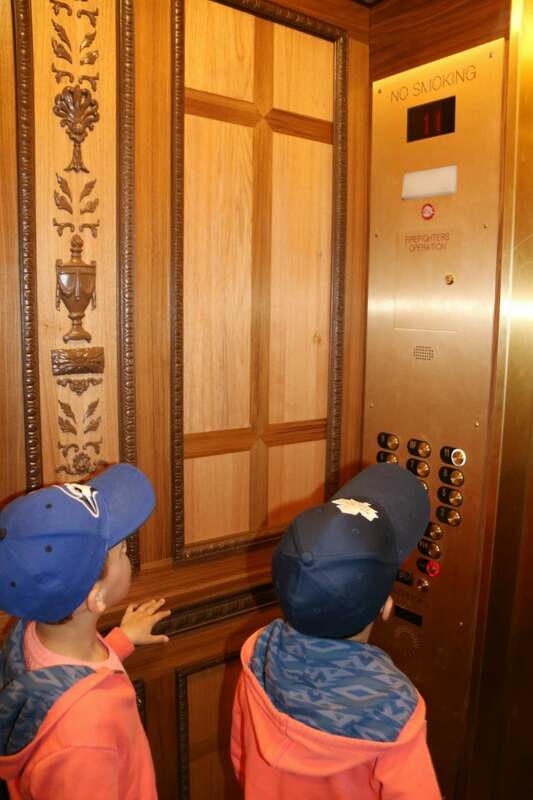 From an old service bell to the ornate details of the elevators we just loved everything about this hotel’s style. Marriott perks and services. Staying at the best Syracuse hotel means that you have all of the expected Marriott perks. From the airport shuttle to the M Club Lounge, breakfast, and drinks, your stay is always guaranteed to be managed in a manner that makes you feel like you are the true MVP in the hotel. When we checked in the front desk agent suggested that we make time to see the ballroom. Even though it was set up for weddings every day while we were there she said if we went up in the morning we could get to see it. Thank goodness she did! Wow – the space is truly remarkable. 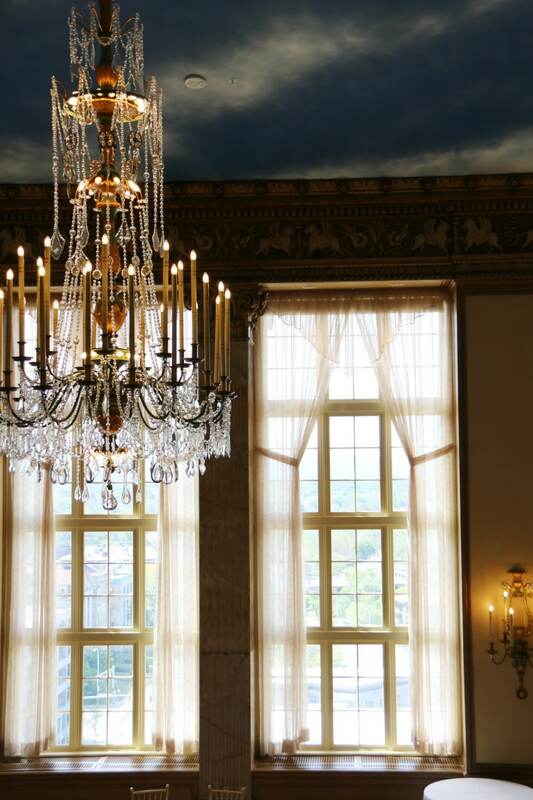 With the remarkable attention to detail, every facet of the ballroom has been restored and recreated to resemble its design and features from the 1920s. It is like stepping into a scene from The Great Gatsby! I could picture the well-dressed men and women from Syracuse high society dancing the Charleston and wishing I could have visited the hotel then. Overlooking Syracuse the view is truly stunning. Plus with the special bride and groom suites you can get ready in style. 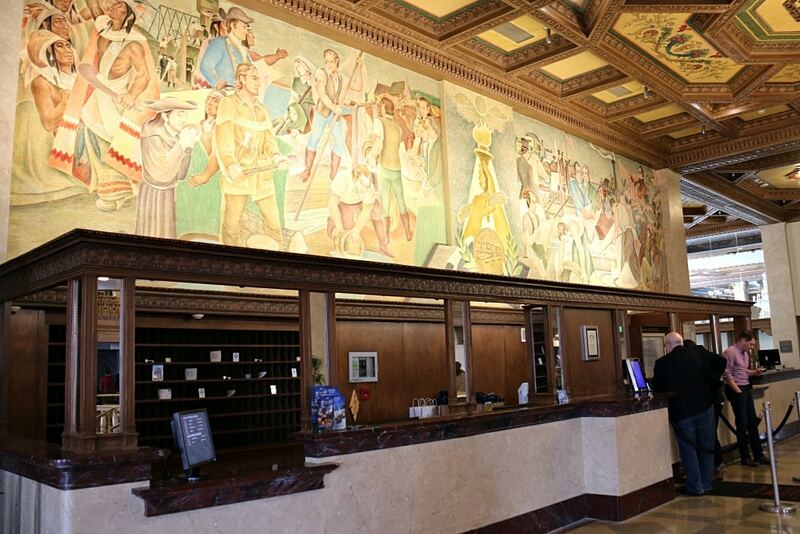 When visiting Syracuse, choosing the best Syracuse hotel is easy. 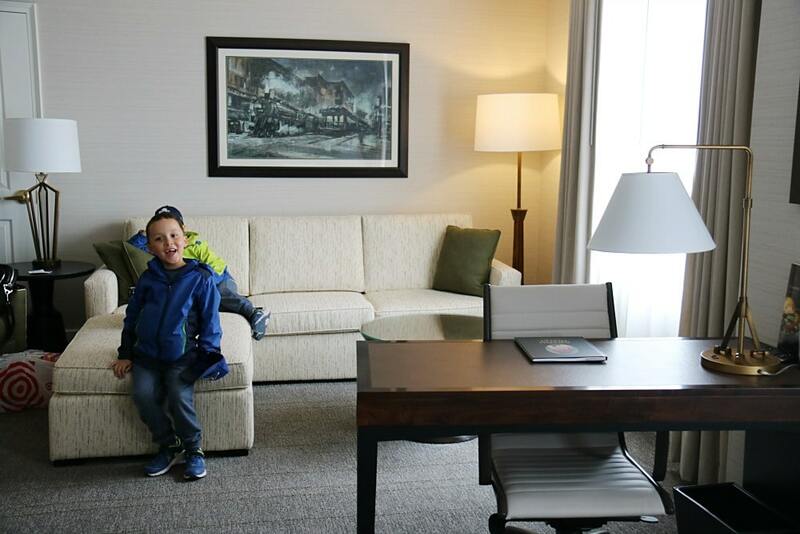 The Marriott Syracuse Hotel Downtown gives you all of the modern amenities you look for and need for your family while being at the centre of the most popular sights and restaurants in Syracuse. Booking a traditional room or a suite for a larger family is easy and guaranteed to fit your needs. We loved every minute of our stay and look forward to returning very soon. Disclosure: We stayed as a guest of Visit Syracuse. As always, all opinions are our own. Oh wow, this looks like beautiful hotel! 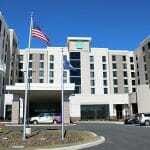 I love staying at Marriott hotels when I travel, the service is always good. 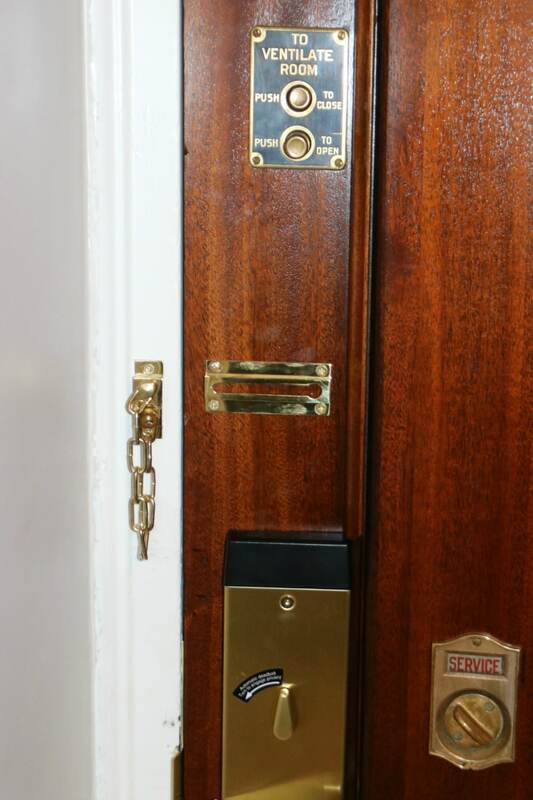 I love how you can choocse between a modern room and a historic room at this hotel.